The rise of Android phones in India has been phenomenal with over 600% YOY growth in the year 2011.Today they hold a comfortable 34% of the Indian smartphone market behind only the (now aging) Symbian OS. Even as analysts and experts have predicted Android phones to double their market share in 2012 and as Samsung , the biggest proponent of Android grows in India , one can expect greater things in the year 2012. Smartphones have grown phenomenally in the year 2011 with a YOY growth of 87%. It is about time for the average Indian to move from the feature phone to the Smartphones and I believe there are 3 strong reasons why Android would not just grow at an increasing rate but in fact Break out with exponential growth. The growth of cellphones happened about a decade ago thanks to the availability of cheaper mobile phones with attractive features. Today mobile phones are available at prices as low as $15- $20 Dollars or roughly Rs 1000 in India. These phones and the proliferation of the communication network all over India has helped in the growth of mobile phone industry. It is no surprise then that Sunil Mittal, CEO of Airtel, India’s largest private telecommunications company urged for the need of super cheap smartphones. Mittal addressed the World Mobile Congress in Barcelona declaring it is time for GSMA, a consortium of hundreds mobile operators to trigger the adoption of cheaper smartphones at prices of less than $100 by placing orders of at least 100 million models. Mittal’s statement echoes that of Google India Head Rajan Anandan, who has also stated that for smartphones to break into 200 million barrier, greater price reduction to the order of 30% is needed. The figure Rajan comes up with not surprisingly is also Rs 5000. There are currently a few products in the market from domestic players that fall below the Rs 5000 barrier. However, most of these run on an outdated version of Android and feature sub standard hardware. Among main brand manufacturers, Samsung is perhaps the closest to this barrier with Samsung Galaxy Y price already at about 7k rupees. We may expect a price drop soon as more models of Samsung are launched. Samsung will also be launching Samsung Galaxy Pocket at a price point lower than Samsung Galaxy Y which could effectively help Android breach the $100 barrier in a big way. India is the largest adopter of Dual Sim Phones in the world. While it started as a quirky feature in few local brands, the phenomena caught on like wild fire. Varying call rates between operators, the need to separate work and personal life or even perhaps the need to travel between 2 states to work or study, had always forced several average mobile phone user to carry 2 cellphones. Dual Sims solved this need and are the norm today. With over 58% market share, you would be hard pressed to find a person who hasn’t owned a dual sim phone at some stage in his/her life. Android phones and other smartphones didn’t have access to this 58% market. The lack of smartphones that had dual sims had always kept a good chunk of consumers from moving from their dual sim feature phone handsets. Samsung recently launched its own range of Dual Sim Androids to capitalize on this innate need. Samsung has launched Samsung Galaxy Y Duos, With the dual sim variants for its popular Androids, Samsung Galaxy Y and Galaxy Ace, Samsung will now be leading the charge along with few domestic makers to convince the Dual Sim feature phone user to migrate to smartphone. For a feature phone user, the general perception of a smartphone has been an expensive phone that lets you play great looking games and takes great looking photographs. However recent spur of promotion of Android Applications by different utility companies, websites and cellphone manufacturers have changed this perception. Be it apps for banking, booking tickets, e-commerce or newspapers there is an Android App that caters to just about any of your personal needs. Google Play as of today features over 1000 free Indian Apps for every perceivable need, be it Book My Show for booking your movie tickets, HDFC’s Banking App for banking, Flipkart’s Android App to shop or Zomato to find a good place to eat. With more aggressive Promotion by mobile manufacturers and service providers, we can expect more feature phone users stand up and take notice of the smartphone revolution. Smartphones have long established their utility for navigation, instant search and staying constantly in touch with friends. The proliferation of Android Apps will definitely help the growth of Android in the year 2012. At the moment however, few public service utilities are available on the Android and will prove to be a great boost for the growth of Android. The Irctc App lets you book train tickets and view status on your reservation. While certain state governments such as Andhra Pradesh and Karnataka have made their electronic bill payment and utility service portals available on Android as Apps too. We can expect these public utility companies to also promote their Android Apps more actively and help create awareness of the limitless opportunities presented by a smartphone. The rise of Android in India seems inevitable at the moment. With increasing net additions, lowering price points and the availability of more India centric utility Apps, Android has caught the imagination of just about every average Indian. 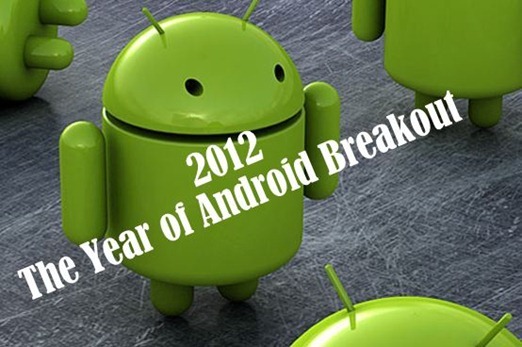 There would be no surprise that 2012 will witness the break out of Android thanks to the combined effort of mobile manufacturers such as Samsung coming out with cheaper models , Developers coming out with more utilitarian apps and aggressive growth of the telecommunication networks in the country. The future of Android is bright in the year 2012. Sitakanta is co-founder of web startup - MySmartPrice.com. He is an alumnus of IIM-Bangalore and has avid interests in Latest Tech & Mobile trends. Women bosses in Indian corporates: What is driving their growth? Is Relaunch of Android One Project on Sunder Pichai’s Agenda During India Visit? By providing an open research and development platform, Android offers utility developers the ability to build extremely rich & innovative applications. Developers are free to take advantage of the device hardware, access location information, run background services, add notifications to the status bar,set alarms, and much, much more.recently i came across this website which provides additional applications like check your eyes and so on… dis product also provides you a reward points just for entering into the shops in which they have tie ups … its really very interesting to came across such start ups.. Interesting article Sir. More innovative mobile utility apps are getting into the India smartphone market especially in Os like Android and Blackberry. Recently I was impressed by Innovative MintM app, in Android phone, converging Loyalty and m-Commerce together. Great value and interesting to use it as I’m an active shopper.. Freely downloadable at..
Free innovative utilitiies like these, provided by Androids increases the usage of smartphones to a large extent. Do you believe Android’s phenomenal growth will NOT have a detrimental effect on the quality of apps available for the platform?